If you said to me that I could only have three pieces of gear for food photography, I would definitely include a tripod. A tripod is a must with food photography or still life photography. Why you need a tripod for food photography. What to look for in a tripod for food photography. What to buy when looking for a tripod for food photography. What is the best tripod for overhead photography. The best tripod for still life photography. 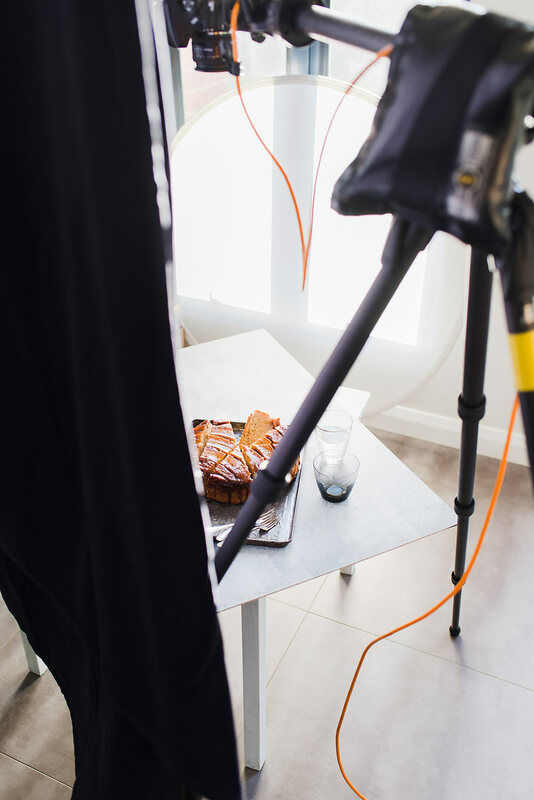 The height you need in a tripod for food photography. How to get the most use out of your tripod for food photography. I’m going to outline some reasons why a tripod is necessary for food photography, still life photography and product photography. Then look at which is the best tripod for food photography. Why do you need a tripod for food photography? Well, good question! Having access to a tripod for food photography helps us in a number of ways. It is a piece of equipment that we need to really improve our food photography. It will help you to take crisp, sharp images. A tripod for food photography will help us to capture sharp images. Camera shake is the biggest contributor to blurry or out of focus shots. One of the easiest ways to reduce camera shake from hand holding your camera is to shoot on a tripod. If you experience blurry images, troubleshoot with these 14 tips I wrote about to take tack-sharp images. 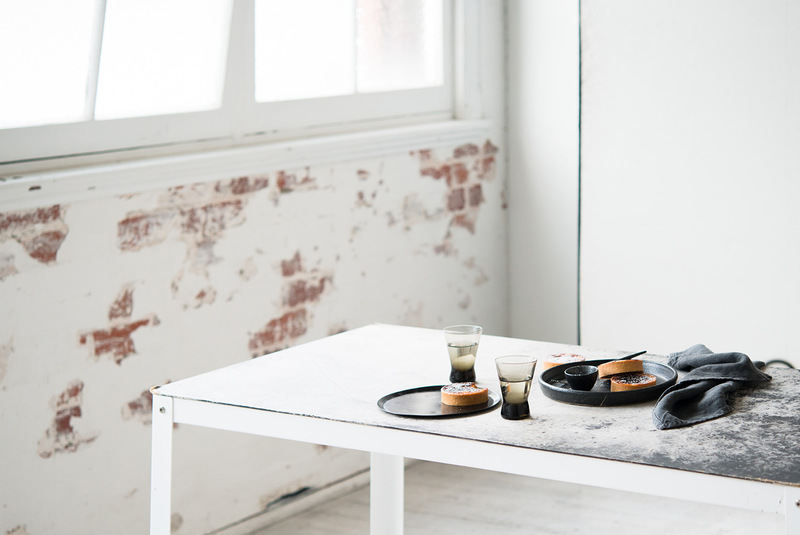 A tripod helps create beautiful compositions in still life photography. Having our hands free when shooting food photography or still life photography can help improve our compositions. This is because composition happens in two stages. First, you style your scene, which happens out of the camera. Secondly, we compose the scene we’ve just created with our camera. So using a tripod for still life photography will help up your game. Seeing the scene that you’ve styled with your eyes is quite different from seeing it with your camera. You might style something that looks good, but in camera, you need to make adjustments. Being able to have both hands free to re-style for composition in camera is important in getting great images. Therefore being on a tripod to have your hands free can drastically improve your images. A tripod will allow you to reduce your ISO and shoot lower shutter speeds. The last reason that we want to own a tripod for food photography is that it helps us to improve the quality of our images. The lower you can get your ISO, the better your image quality. As most food photography and still life photography happens indoors, reducing our ISO usually results in reducing shutter speed. Low shutter speeds increase the risk of blurry images due to camera shake. Having a steady tripod will help us to reduce ISO and shutter speed. If you have low light in the place your shoot still life photography, then it is beneficial to have a tripod to increase image quality. Now we know why we need a tripod in food photography, still life photography and product photography. 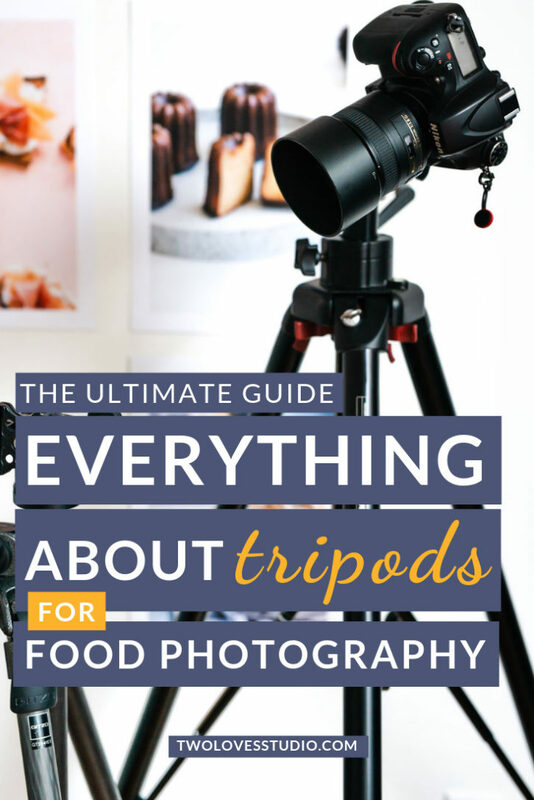 So let’s now look at what to look for in a tripod for food photography or tripod for still life photography. Tripods come in all shapes, sizes and budgets. You can get simple tripods or more elaborate tripods. The best tripod for food photography comes down to a few features that will help you improve your photography. 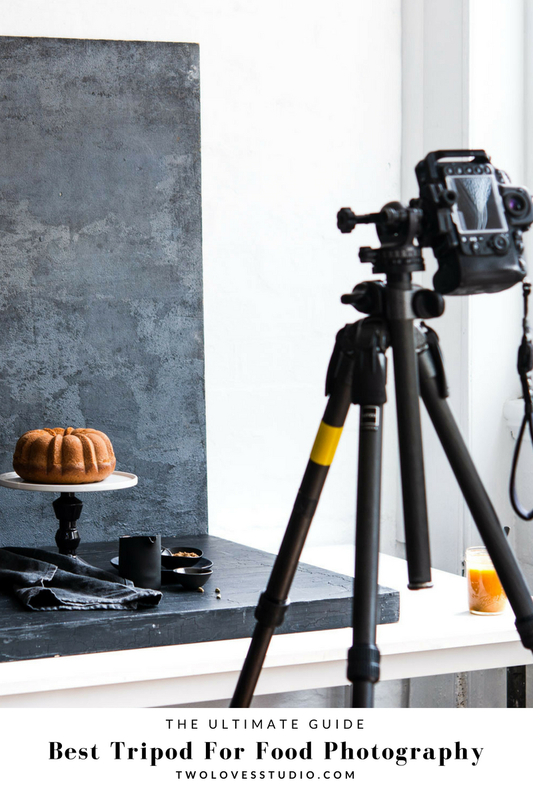 Here are some quick tips to help you know what to look for in a tripod for food photography. Stability. To reduce camera shake as much as possible, it is a good idea to have a hook that you can add weight to for stability. Adjustable height. The lens and focal length you are shooting, plus the height of your setup will determine the height of your tripod. Being able to adjust height is important. Adjustable orientation. 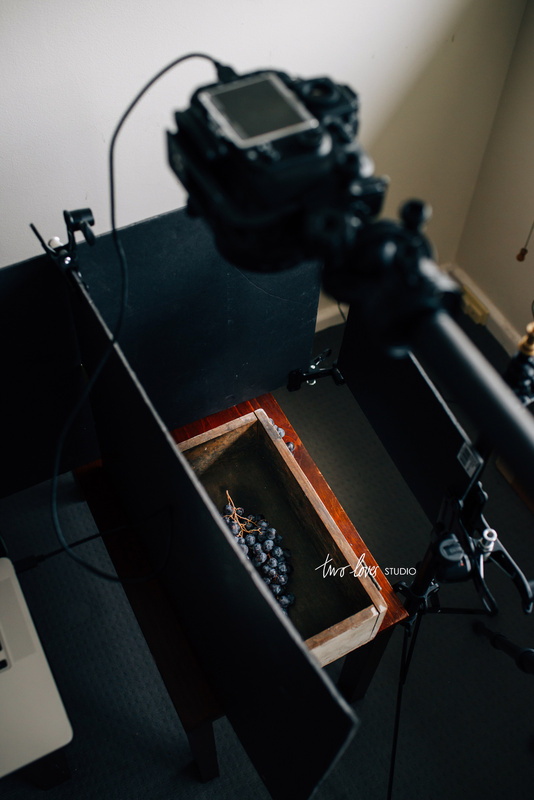 The two most common angles of food photography are overhead and 45-degrees. You will want to get a tripod that allows you to switch to overhead orientation. This is usually where the centrepost can be moved for overhead shooting. Spirit-level. 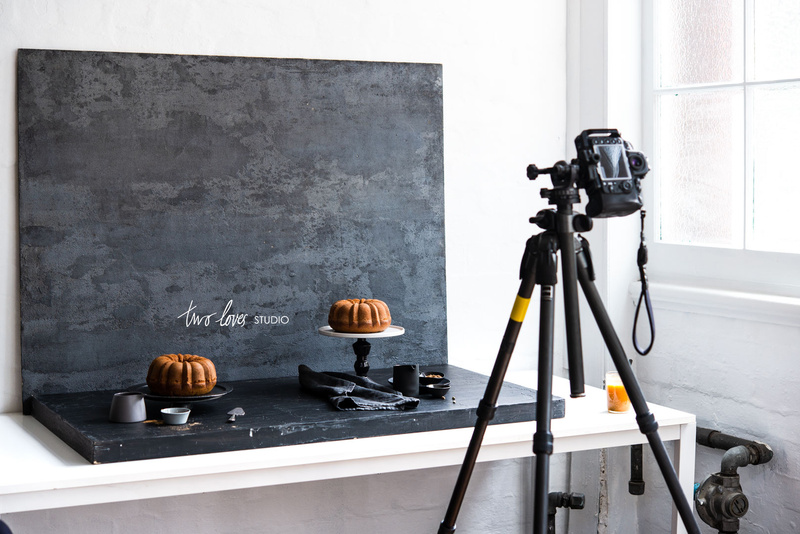 For product and food photography, it’s handy to have a spirit level measurement built into your tripod. This is so that you can make sure your images are straight and level. Stable footing. There are a few types of footings that come on tripods. As food photography is mostly indoors on slippery surfaces (cause no one like crumbs in carpet! ), you’ll want rubber footings rather than pins. This will help your tripod remain and not slip. 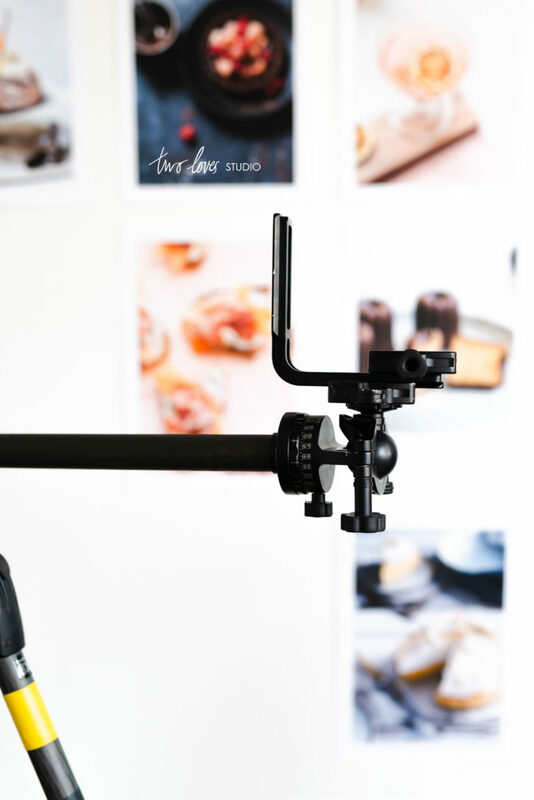 When purchasing a tripod, you’ll want to make sure that the total weight the tripod can hold will safely cover the camera body, lens and any brackets you may use. You’ll want a payload that can cover at least 7-10kg/15-20lbs. 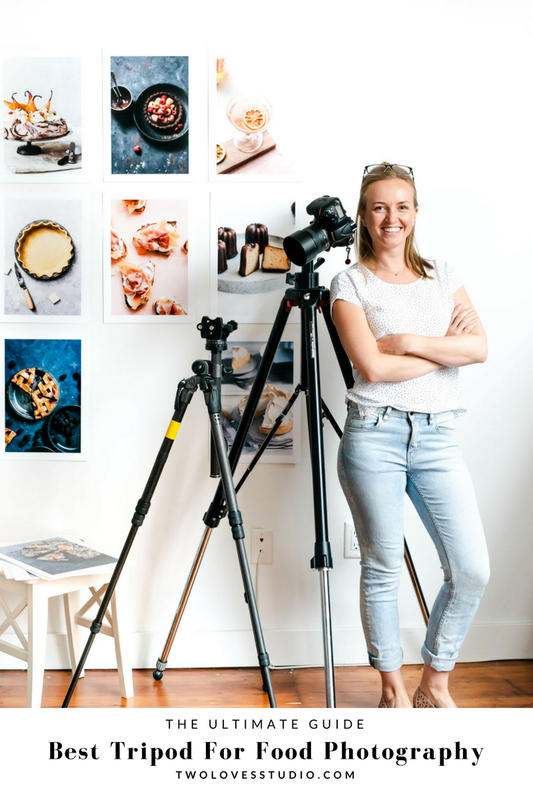 As tripods are designed for different niches of photography and their requirements, there are a few features you don’t need when it comes to food photography. Minimum Height. This is more a landscape photography feature where you need to shoot angles close to the ground. Leg Angle. Also another landscape photography feature. 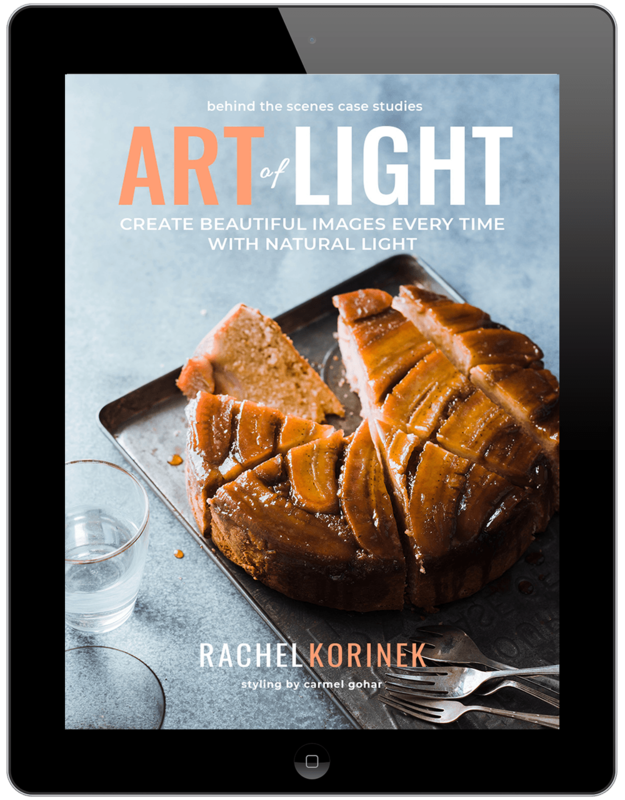 You’ll find yourself in all kinds of uneven ground/terrain in landscape photography that you just don’t get in food photography. In this post, I am recommending tripods from either Manfrotto or Gitzo (which is now owned under the Manfrotto brand). That’s because I have had experience with both of these brands and owned both. 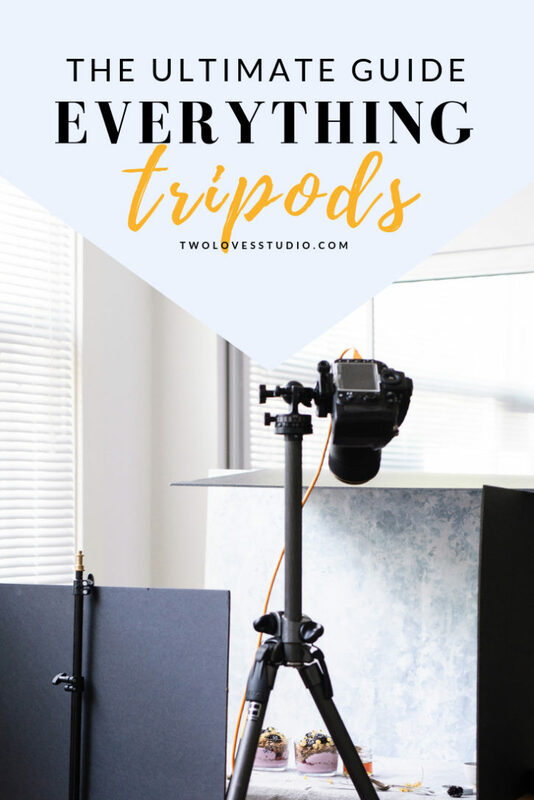 If those brands aren’t for you, then this post will empower you to be able to choose a tripod that’s right for you. Here are the tripods I have had experience using in my career. Remember that food is still life so these suggestions will also help in buying the best tripod for still life photography. My now husband was the one who inspired me to take up photography. Naturally, the gear he used become crucial at the start of my journey. Whilst this particular model isn’t available anymore, there is a similar option you can get today. Whilst this may not seem like a cheap option, it’s definitely a good one if you have a really limited budget. Now you don’t have to be a pro to buy a pro-level tripod. They just usually come with better features and so are more expensive. We’ve had this tripod for years and it is still in impeccable condition and performs really well. Although this model is discontinued, you can find it’s replacement, Gitzo GT2542 Mountaineer Tripod Series 2 here. The best advice I can give is to spend a little more money where you can to invest in the best you can afford. $200-$300 tripods can be limiting in features and you may have to purchase another a year or so down the line. It’s better to put that into a better tripod now, save in the long run and get better quality shots along the way. Being able to think about if you need something that is multi-niche will help you buy the best gear to cover all your needs. The overhead angle in food photography is one of the most popular ways to shoot. Particularly if you have flat food subjects. This angle also helps to tell a story. Now as I’ve been mentioning, a great way to improve your compositions is to have both hands free in order to style your shot. Having a tripod that allows the centrepost to orientate overhead will make your workflow more enjoyable. And allow you to get better shots. What you want to look for is a tripod that allows the centerpost to orientate overhead. Here are some brands and models that do that, including the tripod I use. This tripod is great for food photography as it allows you to get really high. The benefit here is if you have a tall light source or like to work at table height. No more bending onto the floor to compose your scenes. Being able to capture the two most popular (and powerful) angles in food photography is important. It shows prospective clients have you are more than just a one-shot pony. It always allows you to capture a range of angles and the angle that is best for your food subject. Therefore having a centrepost that can be adjusted for height and orientation is important. Having the flexibility to pick and choose your ball head is another benefit. Because you are most than likely going to be shooting at different set-up heights, having adjustable legs and centreposts are important. They give you the flexibility to shoot with your lens of choice. What you want to look for is a tripod that has adjustable legs and centrepost. Plus allows you to pick another ball head ideally. Here are some brands and models that do that. There are two types of columns that you can get with tripods. Geared and Rapid. Rapid – as the name suggests is when you can quickly make large adjustments to the height and orientation of the centre post. 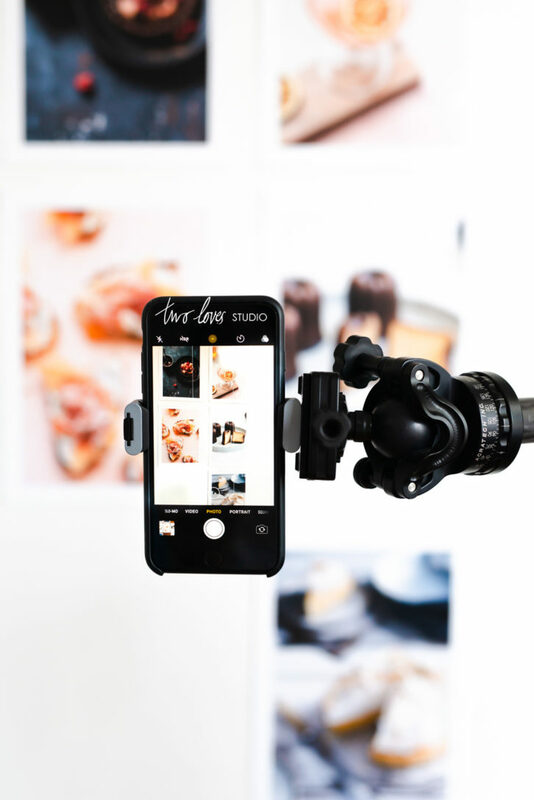 Geared – Lets you make precise changes in height which comes in handy in getting that perfect angle in food photography. 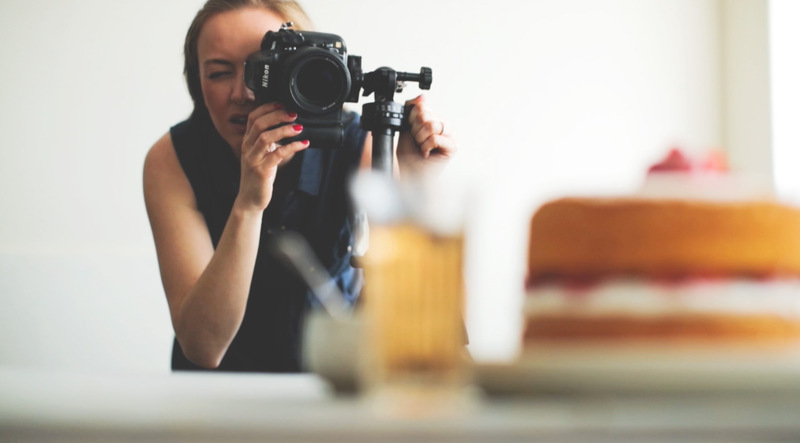 Both types are found in food photography, you just need to make sure you know which your tripod comes with. How high your table is. The amount of space you need to fit into the frame.The lens and camera combination you’re shooting with. Therefore it’s plain to see that adjustable legs and centrepost will get you the most results. You ideally want to get a tripod that maximised the most amount of height possible. If your scene is largely set up on a table that is meant for dining at, you’ll want a tripod that is tall. Something similar to this. This will cost more as it is a premium feature. If you shoot a lot on the ground or at coffee table height, then you can go for something more average. This will cost less than a tripod that can extend to large heights. If you’re shooting with natural light and the height of your window is considered tall, so above hip or waist height, then you will likely need a tripod that can extend taller than the basic tripod height. How Light Should Your Tripod For Food Photography Be? 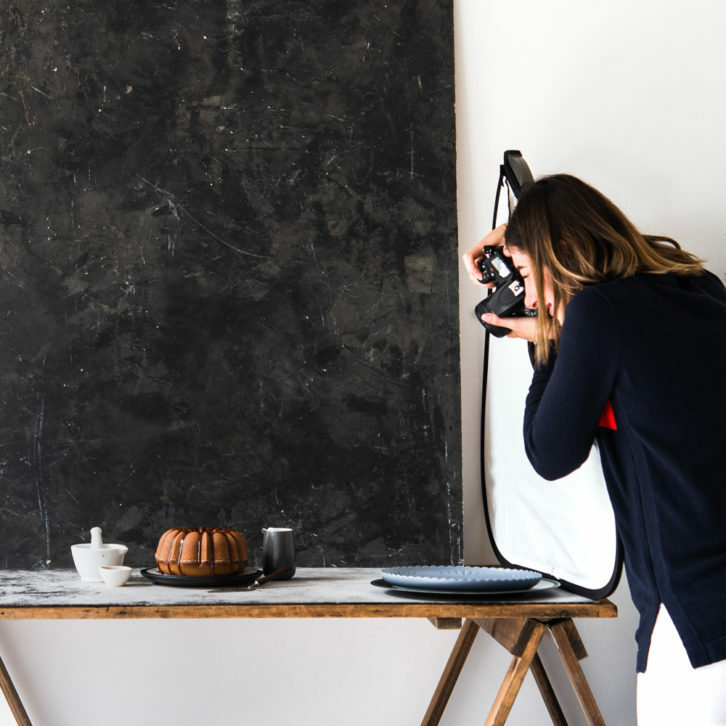 There are two answers to this question, and that depends on the type of food photography that you shoot. There is either; studio based food photography or location-based food photography. 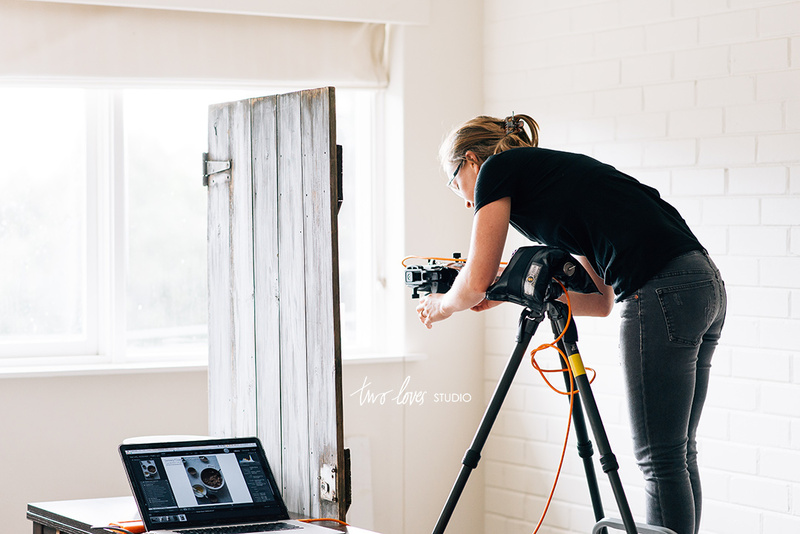 For studio based food photography, and this largely includes shooting at home for your food blog. 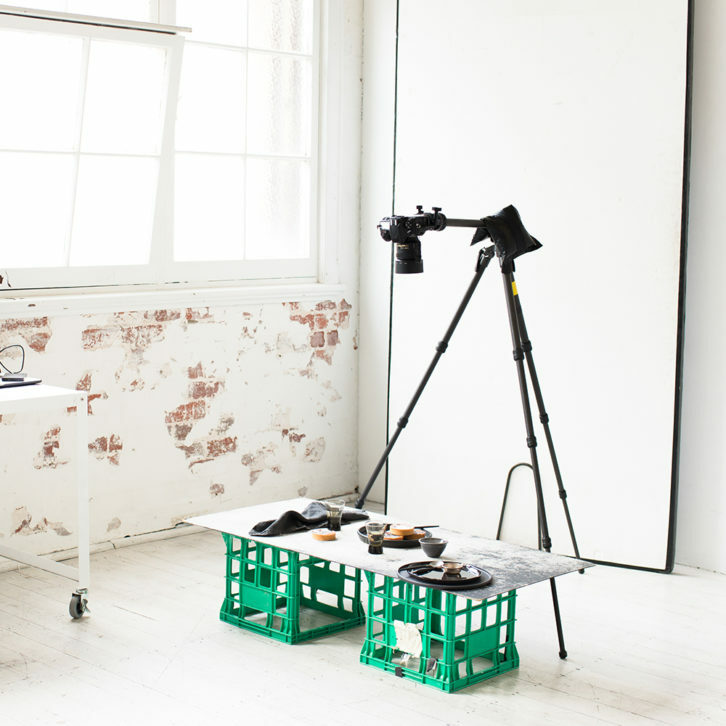 Even if you don’t have a designated studio space, you’re typically shooting in the one location and not travelling with your gear much. As you aren’t lugging your gear around too much, you can get away with heavier tripods. The benefit of heavier tripods is they are largely more stable. You can then trade weight for other premium features like height extension and more expensive ball heads. Heavier tripods can also cost relatively less as they don’t require the more expensive lightweight materials. If on the other hand you mostly shoot location-based food photography, which is for restaurants and cafe. Or maybe TV shows for book covers. Then you are more than likely transporting your gear a lot of the time. It is probably easier on you to then have a more lightweight tripod. This doesn’t need to be a ‘travel’ based tripod as you’ll be transporting your gear mostly by car. Whether you go for a heavier or more lightweight tripod, you will want to make sure that you aren’t trading weight for height. Height is a more important feature to have in still life photography. Again the answer to this depends on what you shoot and at what level you shoot. Are you doing video as well? Most professional food photographers have two tripods. They mostly go for a standard height tripod that they can use to travel on location. Then they will have a tripod that can extend to high heights. They will usually use them for different things. If you are shooting video, then it also makes sense to have a more than one camera angle set up. With the rise of behind the scenes photos for social media platforms, it’s not a bad idea to have a tripod that can hold your smartphone for Instagram Stories. I have this little Manfrotto attachment that can hold my iPhone for shooting behind the scenes as well as Instagram Lives. My advice is to save your pennies and get a really good tripod that has all the bells and whistle if you can. Then use the one you already have as your backup and for shooting behind the scenes. Panning and ball heads are important as they will allow you to switch between landscape and portrait orientation seamlessly. This will give you the most freedom to get the angle right in both overhead and straight-on shots. Being able to make small tweaks to your angle and having the ball head lock in that possible is desirable for the best shots. If you’re using your tripod for video, then considering attachments that allow for smooth panning will be beneficial. Be sure to check out the reviews of attachments you’re thinking of buying, as the last thing you want is poor quality that loosens up over time. 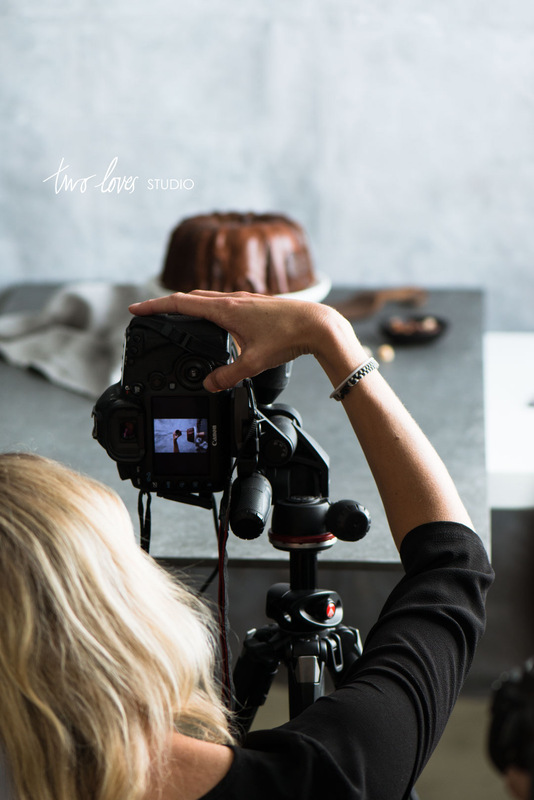 It’s great for food photography as it allows for super small adjustments and tweaks to the position and angle of the camera, so that we can get the perfect angle to compliment the food. It also has a number of spirit levels to make sure you are level when you need to be. Double attachment to the tripod itself for stable overhead shots. This is a great addition to the tripod as it’s very stable and can extend quite a way without compromising your setup and introduce camera shake. Manfrotto Universal, clamp TwistGrip Tripod Adapter Clamp for Smartphones, Silver, compact (MTWISTGRIP). I love how easily this attachment allows me to record landscape and portrait videos. Both straight-on and overhead. I love using it for Instagram Lives and video conferencing. I use this ballhead to be able to make fine tuning adjustments to my shooting angles. It has a few nobs to in which to make adjustments so I can get the perfect shot. What I will say is that if I am shooting with a very head camera and lens combination it can slip a little. But I have had this tripod for well over 7 years and the grips are still strong as ever. This L bracket allows me to seamlessly change the orientation of my camera when in overhead, so that I can easily capture portrait and landscape. It is also adjustable which I have found to be great when tethering to preserve the cable’s integrity. There are two types of shooters, those who use tripods and those who don’t. Usually, they both have a very different workflow. But in my experience, if you want to capture quality work, then you need a tripod. Especially those who shoot natural light. There are times when you will need to shoot in low light. Here are some tips for getting the most out of your tripod. Know the height of your light. Knowing the height of the window or artificial set up that you have will tell you exactly how high your tripod will get you. If you don’t invest the all the money to get the height that you need, you’ll end up sacrificing money for beautiful light. Because light is so important if your tripod doesn’t allow you to capture the beautiful light you need I can tell you that you won’t use it. And that would be a waste of business investment. Understand the height of your tripod for the lens/camera combo. If you shoot with a really tight focal length, this will change what height and setup you need for a tripod. Analyse your favourite images or images you’ve tried to capture but couldn’t. What focal length were they shot on? What lens were they take with? What lens is your favourite to use? Asking yourself these questions will help you to pick the right tripod for you and to make sure it doesn’t collect dust. My set-up, including tripod for moody shots. Learn more. Explore with your camera before mounting to the tripod. A lot of photographers say that they don’t like to shoot on tripods as they get ‘stuck’! This is because we usually set up a tripod and immediately put the camera on top. They then adjust the subjects rather than the angle. In order to get unstuck and improve your images, you will want to explore your scene with your camera to your eye first. See what looks the best, what angle is the best for your subject. Take note of the height and orientation, then set up your tripod to match that. One of the best things about tripods that is they can help you reduce camera shake and get quality images. If you find that you are shooting blurry images all the time, then it could be down to how stable your setup is. Be sure to check out these troubleshooting tips for tack sharp images. At the end of the day there are a number of things to consider when it comes to choosing the right tripod for you. And as always, budget tends to play a role here. I always think it is better to spend a little bit more money to get everything you want in one. If you sacrifice important aspects, then you might also sacrifice quality images. 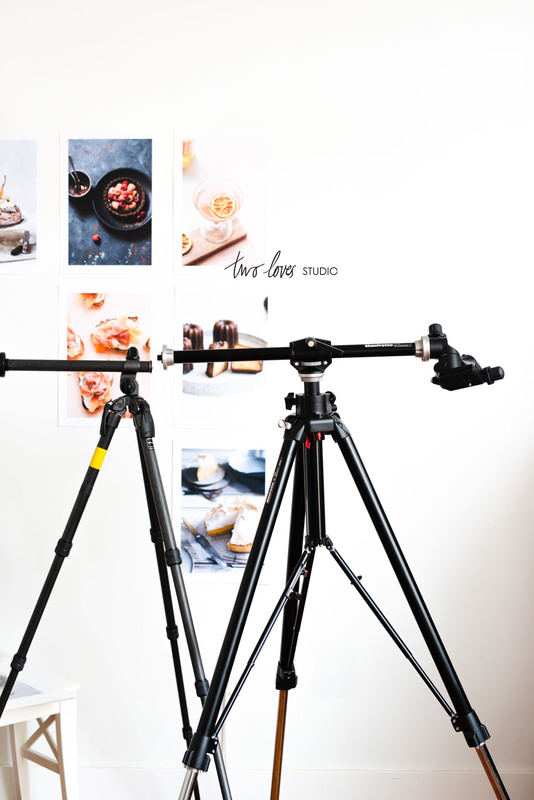 The things to look at when deciding what the best tripod for food photography is, be sure to come back to these points. And as always, look at your light source. Think about the height you need to really capture the best light possible. Read: How to Manipulate Light At Home. 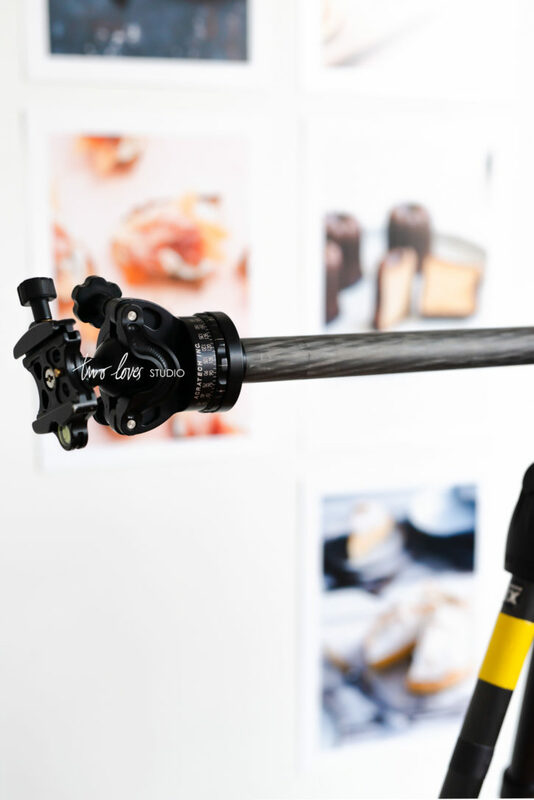 Are you dreaming of a certain tripod to add to your food photography? Or perhaps you already have the best tripod for food photography. 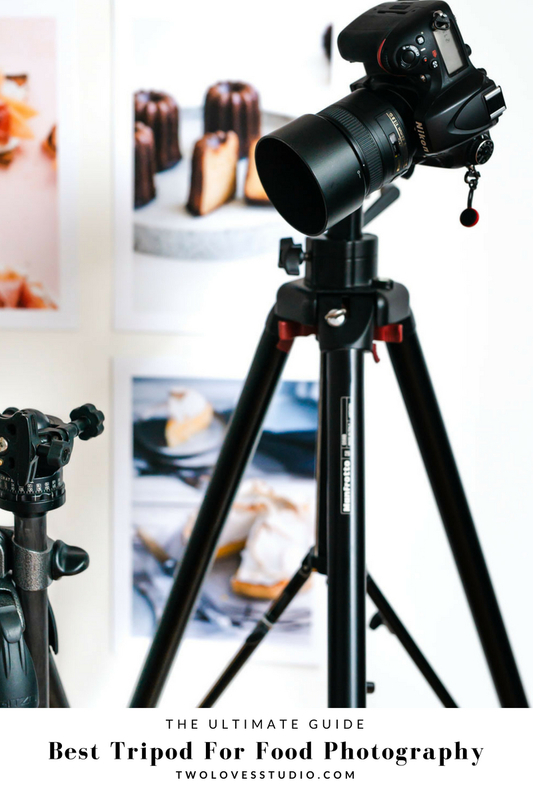 Let me know which tripod for food photography that is currently on your wishlist. 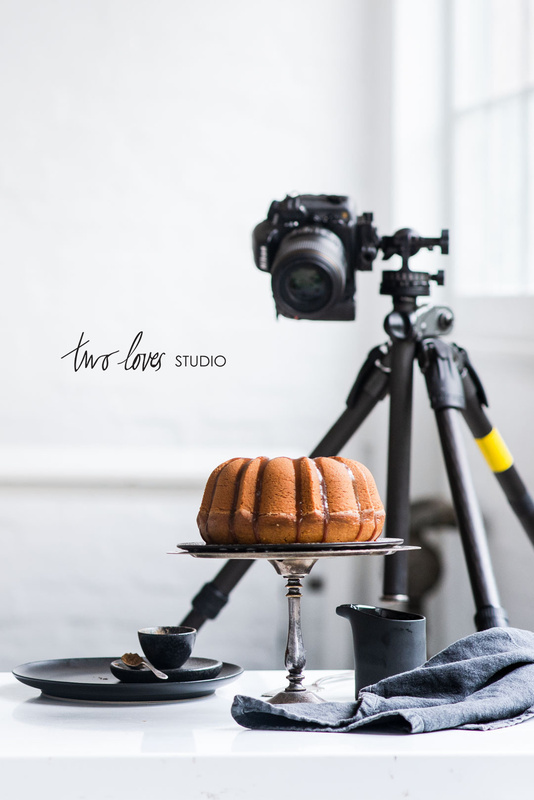 Two Loves Studio was not paid to write this post, however, it does contain affiliate links. If you purchase an item from an affiliate link, Two Loves Studio does get a commission on the sale which goes towards continuing to provide awesome content. Only affiliates for products/services I believe in and that align with my values appear on this site. These products were paid for by myself. All opinions are my own. It was a big investment but it is sturdy, I never trip on the legs and it is so excellent for overheads. It sure an investment but it can really improve your workflow and photos beyond belief. Thanks for sharing what works for you! 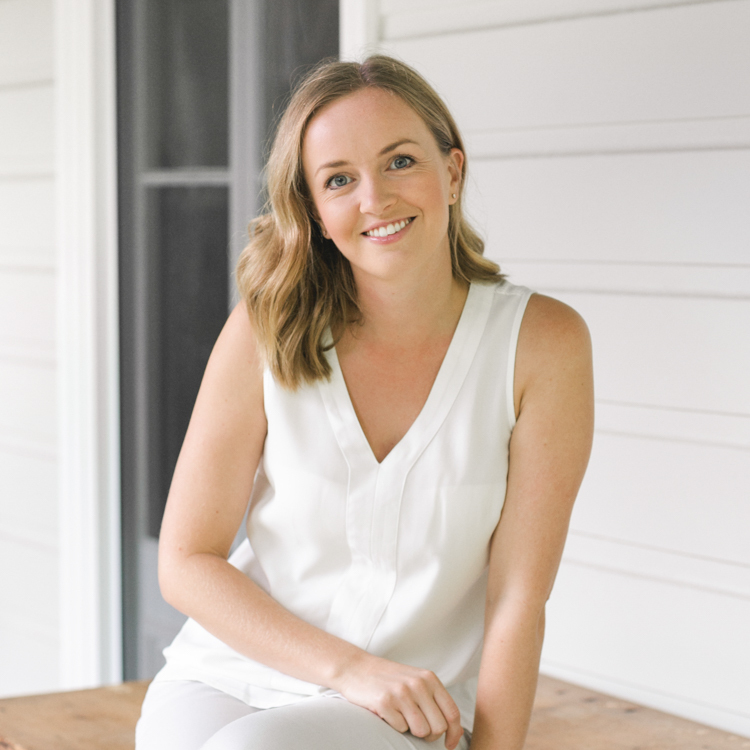 Great topic, Rachel – I am looking forward to reading it! Can I ask where you got the backdrop from that is used in the image (and others in this post?) 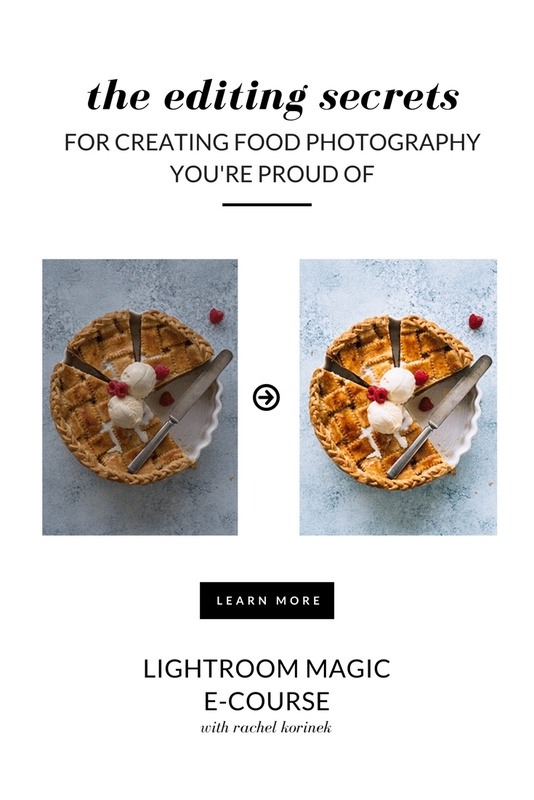 with the two round cakes (under the section “Pro Level Food Photography Tripods”)? Very interesting read, Rachel. You’ve made me re-think my tripod strategy. I have been using a Bogen 3021 tripod with the Manfrotto 131D Arm for overheads. I went with this combination because my father had given me the Bogen since he was no longer using it and I only needed to spend $100 for the arm. It saved me a few hundred dollars which was huge when I was starting out. However, I have found that the Bogen 3025 head on the tripod doesn’t attach solidly to the Manfrotto arm even though Manfrotto makes both products. I have to cut some rubber pieces to stabilize the connection. It works but is a headache every time I have to set up for overheads. So I had been thinking it was time to upgrade and was considering the Manfrotto MT055XPRO3 Tripod with the 410 Junior Geared Head. The center column being able to swing into a horizontal position is a huge draw. 1. Have you had any problems with the 410 Geared Head connecting solidly to the 131D Arm? 2. In the Best Tripod For Overhead Photography section, you mentioned having the Manfrotto 058B Tripod. Do you use the Manfrotto 058B with the 131D Arm even though the 058B has a centerpost that swings to orientate overhead? I totally get it! I am grateful to be in a place where I can invest. It wasn’t like that at the start, but it’s definitely what I try to do 9 times out of 10. So far no problems with the head connecting to the arm. It’s a seamless screw into place, and is solid and stable. I did buy the 131D Arm for the 058B tripod as the tripod doesn’t have a centre column that moves overhead. I just double checked to make sure I linked to the correct tripod (in case I didn’t) but it’s correct. Perhaps you’re looking at another tripod from this post? Let me know! Hi Rachel – Just posting here in case anyone wants to look at what I got. 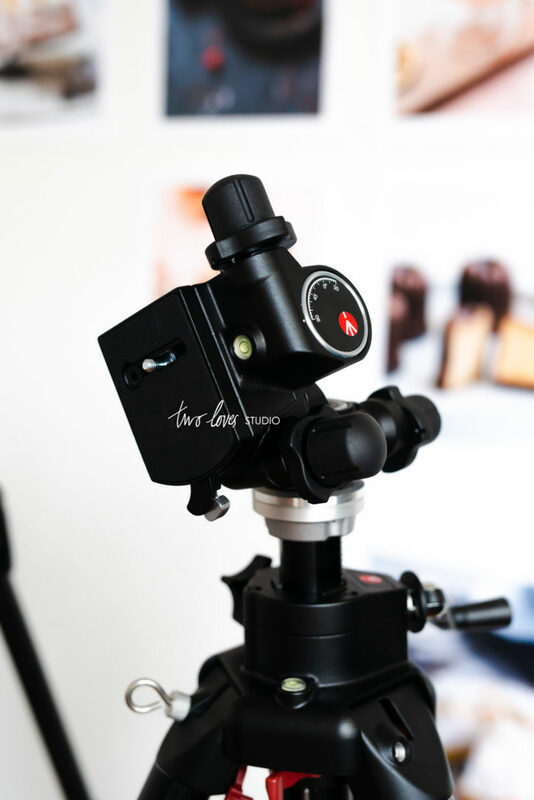 With this head: Sirui K-20X 38mm Ballhead with quick release for $129.99. I used it this past weekend for my last three photos in my feed and it was great. Also..I had a little extra $ so I ordered the sliding arm attachment from Slik ?. I got my gear inspiration from @peaceful_cuisine ? I need your help if this tripod (Manfrotto MK190XPRO3-3W 190 Aluminum 3 Section Kit ) can get me overhead shots as I am little bit confused. I am stuck between limited options and I felt this one may fit. Hey Deena, in the specs it says ‘Quickly switch from vertical to horizontal operation’ so that looks like it does. There are a few YouTube videos that show the centre column does orientate overhead. This looks like a compact tripod and the payload is only 6kg, so it may not be good enough for a DSLR (depending on lens). My tripod payload is double that. I have the Manfrotto 055XPRO3 with a center column (the standard that tilts 90 degrees for overhead shots, however a bit short). I am looking for something to help me refine my food photographing. I find that it takes too long time to finetune, level etc. I have a standard ball head and am thinking about buying something else. You write about the Manfrotto Junior Geared Head and I have also heard about fluid heads (usually used for film but should be great for still photography). When I do overhead shots I find it difficult to get the lines straight and I find then once I tighten a screw in the setup and slip the camera it drops a little and is no more straight/even ? (same goes for other shots than overhead). – What equipment would I benefit from to fine adjust my setup to the manfrotto tripod? – Any other tips on how to struggle less to setup both for straight on and overhead shots that never seem to be even/in level etc for me? Hi Susanne, I definitely feel your pain. It seems like you have two issues here. One is that your ball head isn’t good or tight enough anymore. That is a problem. If it can’t hold the weight of your camera and lens, then it won’t allow you to work efficiently. So in order to address that problem, you need to get something more quality as it isn’t allowing you to get overhead shots. In terms of fine-tuning, I would say it’s more of a luxury than a necessity. I used my Achratech Ballhead for years and it was fine. But the slipping issue needs to be addressed for sure. In terms of the arm, it’s not just about the length. You also need the tripod to be sturdy enough to support a long arm and then 12kg payload. The length will also depend on the height. So if your tripod isn’t tall enough (and can’t extend) OR can’t hold a reasonable payload then the arm may not in itself provide much. It sounds like to me, you need a better ball head. Getting perfectly straight overhead can be tricky. It’s a combination of quality gear, small adjustments, but also adjusting the legs. Sometimes floors or our work table isn’t perfectly flat either. I usually try my best to get the shot right in camera, but then make fine tweaks in post-production. Correcting distortion and lines is something I teach in Lightroom Magic so you can get the perfect shot each time. I can see I need to clarify on the issue about the camera slipping from the ballhead. That it isn’t tight enough anymore. I didn’t make myself clear so I will try again. The ballhead is suited for the weight and has had this ‘issue’ since day one. To clarify: It is not like it slowly slips a little and moves away from the position I left it in. It is more like this: While adjusting position I naturally ‘hold’ the camera since this is the way I move it around in the ball head. The issue is that once tighten it and let go of holding the camera than its like there is a natural little dive/move downwards as the camera weight is added. Do you think I would benefit from the Manfrotto 410 Junior Geared Head in that case? Hey Maha, excited to hear that you are looking to buy the Manfrotto! If you get the arm, you can attach the camera straight to the arm. However you will be greatly limited in changing angles. With higher-end tripods, you purchase all the accessories separately so that you get exactly what you want. I would strongly recommend getting a ball or geared head, as, without it, you won’t be a full range of movement or to make little adjustments. The geared head mentioned in this post is a gamechanger. Hello Rachel, I have not used a tripod before and I am realizing it would be positively impactful. I didn’t notice before that I always have a slight shake when I take photos. Barely noticeable, but present nonetheless. I liked the Manfrotto tripod ( Manfrotto 058B Triaut Camera Tripod – Replaces 3251) that you linked to in your post. It was around $500. Do I need anything else to go with it? I intend to shoot both angled and overhead photographs and eventually maybe video. Do I need an additional ball head (?) and the arm to enable me to do so? Thanks in advance! Hey Ashley! Absolutely. We can get ‘stuck’ in one place using tripods, but there are so many benefits to them as well. It will really allow you to shoot in low light and to style your set with your hands free! It’s a great question. As we start to get into the higher priced tripods (and more pro level tripods), you can think of them as ‘a la carte’. Meaning that you pick and choose the accessories so that you get exactly what you want. Entry level tripods tend to come all in one, but they can be limited. The 058B Tripod is just the tripod. We need to get a ‘gearhead’ or a ‘ball-head’ separately. I would also recommend getting the additional arm for overhead shots. I also use the arm in 45 degree shots. Sometimes the tripod is in a weird position and the arm helps me get extension and flexibility. It’s an investment, but this will be the only tripod you’ll need for in-studio. It’s such a game changer. It’s worth every penny. Thank you, Rachel for your helpful response to my questions. I have added all the items (tripod and accessories) to my Amazon wishlist and hope to eventually purchase them. My mom visited over Christmas and brought me her old tripod that is collecting dust at her house. For now I will use her “vintage” tripod to shoot my overhead shots. Something is not quite right with the arm as it will not support weight of my Canon Rebel camera in the 45 degree position. At least I have for the overhead shots, though. Sounds perfect Ashley! It will give you a good understanding of the limitations of the tripod and what you want in a new one.